Will Israel attack Iran? It cannot be ruled out. » Ambassador Fabian’s blog, KP Fabian, Analyst - international political developments, global issues, Indian national issues. The sad truth is that an Israeli attack on Iran cannot be ruled out. NOBODY, not even Israel’s Prime Minister Netanyahu, knows the answer to the question whether Israel will attack Iran. It is easier to answer another: Will it be wise and prudent on Israel’s part to attack Israel? The answer is “no”. 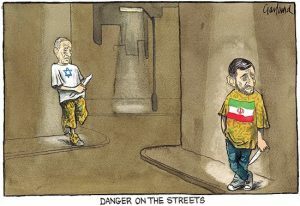 The sad truth is that an Israeli attack on Iran cannot be ruled out. One comes to this conclusion going by Israel’s track record, the recent pronouncements made by its leaders, and the encouragement it is receiving from the US, not necessarily from the White House. The White House can be compelled to come to Israel’s rescue through a fait accompli. In June 1981, Israel carried out a successful surgical strike at Iraq’s nuclear facility called Osirak, close to Baghdad. The idea of such a strike originated in the mid- 1970s. A full-scale model was built up for practice bombing. The Israeli jets over-flew the airspace of Jordan and Saudi Arabia. While over-flying Saudi Arabia, the crew pretended to be Jordanians and vice versa. Saddam Hussein’s Iraq was in no position to retaliate. Ten Iraqis and a French national were killed. It was only a research reactor supplied and closely monitored and controlled by the French. Israel was over-reacting. The reactor was designed to make it “unsuitable” to make bombs. The UN Security Council by a resolution condemned Israel, demanded it to pay compensation to Iraq and urged that its nuclear facilities be put under International Atomic Energy Agency (IAEA) safeguards. More pertinently, the Security Council called upon Israel to “refrain in the future from any such acts or threats thereof”. Obviously, by threatening Iran in the present case, Israel has violated UN Security Council Resolution 487 of June 19, 1981. There are two or three other matters to be noted about the 1981 strike. Before the attack, Israel arranged for the murder of Yehya El Mashad, an Egyptian scientist working on Osirak. It also arranged for the destruction of the core structure of the reactor about to be shipped from France. After the attack, 100 members of the 120-strong Knesset wrote a letter to Prime Minister Begin to show their admiration. Simon Peres, the current President, then leader of the Opposition, criticised the attack and lost heavily in the general election held three weeks after the development. What was the impact of the surgical strike on Iraq’s future behaviour? Was it intimidated into abandoning all plans for making bombs in the future? The answer is a clear “no”. As a knowledgeable Iraqi scientist put it, before the attack 400 scientists were working and the investment was $400 million. Post-Osirak, Saddam Hussein started a secret project with 7,000 scientists and $10 billion. Israel’s action illustrates “folly” as defined by Barbara Tuchman in her well-known book “The March of Folly”. Its action was recognised by the strategic community as a case of “pre-emptive strike”, often with misplaced admiration. However, Israel was not the first power to bomb Osirak. In September 1980, Iran bombed it, without causing much serious damage. Iran was publicly urged to do that by a senior Israeli intelligence official, Yehoshua Saguy. In the case of the Israeli attack of 1981, Iran offered emergency landing facility in Tabriz for the Israeli aircraft. Iran’s attack in 1980 was the first such attack on a nuclear reactor. Is there some irony that Iran should be the potential victim now of a pre-emptive strike? As a matter of fact, the war against Iran has already started. Iran’s centrifuges were incapacitated by a computer virus. A few Iranian nuclear scientists have been killed in explosions. The economic sanctions imposed by the US and the European Union are tightening. The US has been sending inconsistent signals. President Obama does not want to encourage Israel to strike. He knows the implications. Iran in 2011-12 is much stronger than Iraq was in 1981. Iran is stronger thanks to the US war on Iraq facilitating the emergence of an Iran-friendly regime in Iraq. Iran can retaliate in many ways. If it attempts to block the passage of oil tankers through the Straits of Hormuz, oil prices will shoot up; global economic recovery will be imperiled; candidate Obama will pay a heavy political price for the higher price at the pump. The Hezbollah and the Hamas can send rockets into Israel. Obama also knows that if Israel is under attack, the US will have to rush to its rescue. The US embassies in West Asia can come under attack. It is the Republican-dominated Congress that has been tightening sanctions again Iran and deliberately encouraging Israel. The IAEA’s latest report does not add to its credibility. There is no serious evidence to show that Iran is after the bomb. In any case, if there is reason to suspect that Iran is after the bomb, the smart thing to do is to flood Iran with IAEA inspectors. Conceding Iran’s right to enrich uranium up to the industrial grade is a small price to pay for that purpose. India was wrong to have voted against Iran at the IAEA. There seems to be a recognition of that error. India will suffer in a big way if Israel attacks Iran. To say that it is not in India’s interest to have a nuclear-armed Iran is different from not perceiving the dangerous course that Israel has embarked on. Ambassador K. P. Fabian, a retired IFS officer, is the author of “Commonsense on War on Iraq”.